2CV racks up the miles – HubNut – celebrating the average! Right. Enough about electric cars for the moment. I should probably talk a bit about the cars I actually own. Fleet update! The 2CV has been very busy of late. In the past five weeks, Elly has clocked up 1100 miles. That’s 220 per week. It may not sound that high – lots of cars do an awful lot more – but bear in mind that I work from home and own another car too. Quite a lot of that five weeks has been spent sitting around doing nothing. Those 1100 miles include trips to Anglesey, Wiltshire, Stratford-upon-Avon and Cosford near Wolverhampton. Roads have varied from tiny mountain lanes to urban speed-humped nightmares and motorways. Some of those miles were clocked up on a race track. In short, she has been pretty busy. To put that into perspective, she covered only 1100 miles between April and mid-August in total. The previous year, she clocked up only 4234 miles and the year before that, a mere 3123. Stark contrast to 2006-2007 when I somehow clocked up 15,614 miles! I was commuting 45-50 miles a day at the time, but I still owned many different vehicles. That mileage did include also our wedding and honeymoon in Devon/Cornwall but even so, it’s a bit extraordinary. Anyway, I’m drifting again. The point I’m making is that Elly has been very busy of late. Not that she’s showing much sign of distress at all of this mileage. She’s running very nicely indeed. 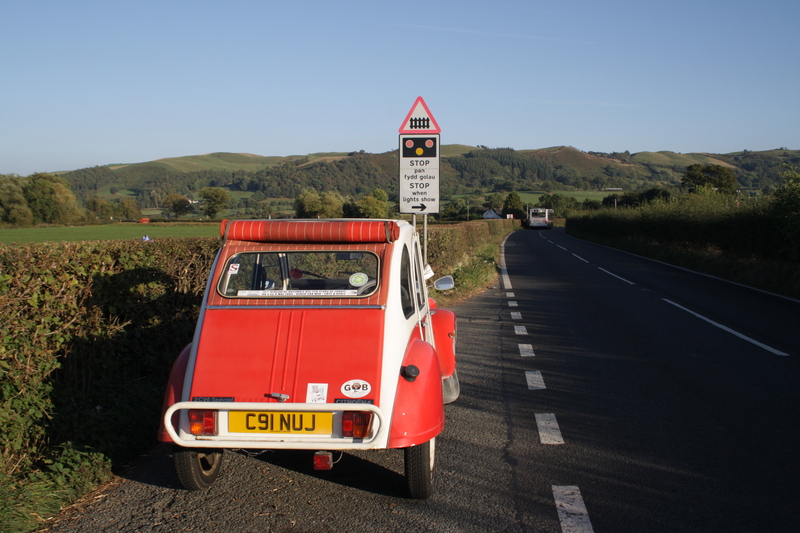 With my ear filters fitted, the cacophony that is a 2CV at speed isn’t an issue either. If anything, those filters seem very good at blocking out wind noise, but I can still hear the engine. I don’t like not being able to hear what’s going on. I even seem to be choosing the 2CV over the Rover at the moment. It seems I’m utterly failing to bond with the Brummie-built Honda. It hasn’t helped that in the past couple of weeks, I’ve driven lots of different hydropneumatic Citroens. They have each reminded me just how much I like comfortable suspension! The Ronda is just not comfortable – albeit it’s an awful lot better than the Daihatsu Sirion and Maestro van. That’s not saying much. I just find it so hard to love the Rover. Yes, the steering is quite nice, but the incessant buzz from the back end somewhere is not. I think it’s the torsion bars that hold the bootlid open. The ride isn’t smooth enough. The engine is just horrible. The clutch is hopeless. It is not proving to be a joyous ownership experience. For this reason, I should imagine it will be for sale pretty shortly. The only reason I haven’t put it on the market already is that I’ve just taxed it, had some lovely Uniroyal tyres fitted to it and there’s the small detail of the DVLA not yet processing the logbook. The fact that I’m choosing a 2CV over it doesn’t make the Rover look good though does it? Mind you, no other car in the world ever seems to have made quite such an impression on me. Perhaps it isn’t the Rover’s fault. Oh well. It at least gives me plenty of time to consider what I might like next. A Xantia maybe? Or perhaps even a C5 Mk1? Or can I find comfort in a car that doesn’t require the magic of hydropneumatic?